""Netherlands based review of the E.P. ...Not bad at all, but the person who wrote it is damn near a prophet!!! ...Without speaking to me, the label, or my manager personally, they 110% predicted that the E.P. was a departure from my 'softer' side and (without hearing a note of it) that the forthcoming full length record takes a definitive darker, grittier turn at the wheel...No official release date set on that yet, but hang tight folks, you're in for a treat!"" I do not know about being a prophet, though it does seem you are about to find out about that treat, as that release date is finally upon us all: 27 April 2018. This may have been a bit longer than Bullard had hoped for at the time, but the waiting was worth it. Double and then some. Let's start with the cover. The hippie age has reached the Carolinas it seems. It is in a way provocative but at the same time holds a tongue in cheek element as well, by depicting Bullard in a not too serious drawing. The cover can also be seen as a warning: expect the unexpected. The title in the right hand corner is nothing but a statement, full disclosure. Brace yourself to rock! And does Full Tilt Boogie? You are about to find out. The very first chords are deep, dark, heavy set guitar chords strummed full on. "Lord, have mercy on me", Bullard sings. Well it seems his prayer has been heard, as this song really rocks out. Shining a light of providence over it all. The deep, dark accents of the distorted guitar paves the way for a fiery slide guitar solo and a warm sounding Hammond organ, placing some fine accents in the deeper layers of the sound. 'Lord Have Mercy', is only the kick off of the album. The boogie really starts in the second song. 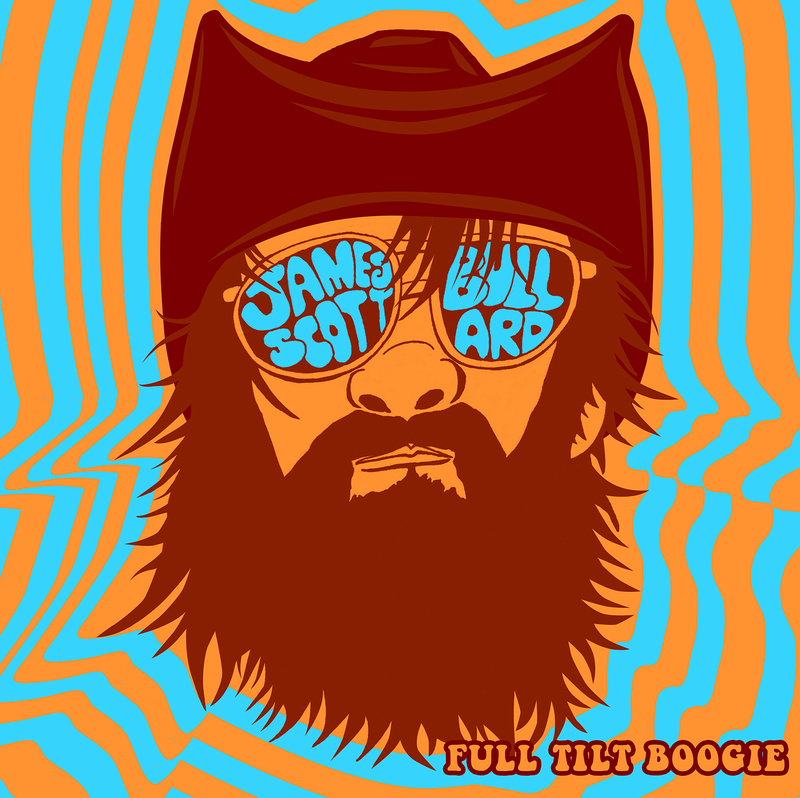 'Wicked Ways', no, it's not a cover of the Waylon song (who released a country rock album last week, I haven't had the chance to listen to yet), is full tilt boogie to the max. A rollicking, whopping kind of song as if riding a horse at full speed across the desert. A song about a son living the life his dad lived, against all the warnings of his dear mother. If James Scott Bullard's wicked ways lead to songs like this, there's no need for forgiveness. The lord already has shown his mercy, James. A song like this does nothing then bring huge smiles to the faces of the people listening to it, bringing happiness and joy. If I could write and play songs like these, I wouldn't give those ways up for nothing and nobody, mate. And that's just where the fun begins. Just listen to that intro of 'All To Pieces'. Something many artist would kill for, and now that would be sinning. 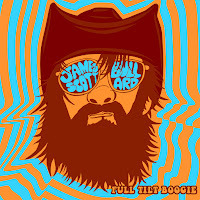 Full Tilt Boogie is getting into its groove and is outpacing many albums in its sort I've heard recently as is competing full on with my favourites in the genre. Just listen to that guitar solo going at it. This is as good as the very best songs of The Black Crowes and outpacing anything Lynyrd Skynyrd did in the past 30 years. Better than anything by ZZ Top (o.k., barred 'Tush'). On Full Tilt Boogie a few worlds come together. There certainly is a country/roots element hidden in all the rock. Blues rock comes in strong. Rock and roll takes its part, while the attack of classic rock rears it rocking head. For me its a match made in heaven, to stick to religious metaphors. Bullard chose to make his sound rough and loud. It leads to an album that is made for dancing at shows. Live this has to downright fantastic. Time to come over some time soon, Mr. Bullard. There's a market for your music here. By using dynamics within the songs and changing the lead instruments between guitar and piano Full Tilt Boogie gets the diversity it deserves and adds another point to the overall score.The only thing a listener has to be afraid of is an overdose of enthusiasm. As it comes in spades on the album. Yes, there are some easy to spot influences on Full Tilt Boogie. Johnny Cash, some country artists I don't mind not mentioning and even Stevie Ray Vaughan can be spotted here and there in the fiery guitar parts. These influences are only there to tell the story of Full Tilt Boogie and nothing else. To give the album a little extra flavour without giving any of its own unique overtones away. Is it perfect? Perhaps not, but it gets very close. The best in its sort I've heard for years.